By Graham Edwards, Cinefex on July 22, 2015 at 9:58 a.m. In film, small worlds make for some pretty big adventures. This story originally appeared on the Cinefex blog on 7/21/2015 and is republished here with permission. Learn more about Cinefex magazine here. Small is big. If you're in any doubt of that, check out Marvel's Ant-Man, the latest in a long line of movies in which ordinary human beings are reduced to the size of bugs. In Ant-Man, con-artist Scott Lang (Paul Rudd) dons a special suit charged with sub-atomic particles, which causes him to shrink to near-microscopic proportions. Drastically diminished, Rudd faces the considerable challenges posed by an ordinary world magnified to extraordinary proportions. Good job the side-effects of the miniaturization process imbued him with super-strength. You'll be able to read the complete story of the visual effects of Ant-Man in the next issue of Cinefex magazine, available to preorder now. To whet your appetite, this article includes exclusive insights from Jake Morrison, Ant-Man's visual effects supervisor, about the challenges involved in creating Marvel's latest – and littlest – screen hero. Before hearing from Jake, however, we're going to take out our magnifying glasses and examine some of the other movies which have delighted in pitting pocket-sized heroes against teeny-tiny villains. 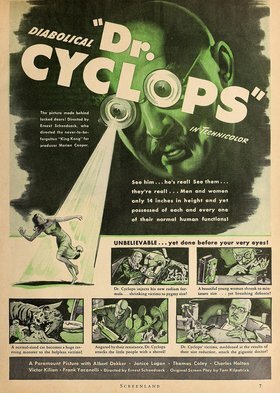 "Dr. Cyclops" advertisement from the May 1940 issue of "Screenland"
In the 1936 film The Devil-Doll, escaped convict Paul Lavond (Lionel Barrymore) creates a pair of tiny assassins to take vengeance on his former business associates. The film uses an impressive box of photographic tricks to plant its miniature killers into their oversized world, including the traveling matte process – state of the art at the time – used to optically "cut-out" actors and insert them at reduced size into regular live-action scenes. Four years later, the still more ambitious Dr. Cyclops was released. In the film, a group of scientists are shrunk to a height of just fourteen inches by the nefarious Dr. Alexander Thorkel (Albert Decker). Directed by Ernest B. Schoedsack, Dr. Cyclops was photographed in Technicolor and boasts oversized sets, giant props – including a huge, mechanically-operated human hand – all backed up with an dizzying array of split-screen and glass shots designed to combine regular actors with optically enlarged backgrounds. "Each scene was carefully mapped out. Scale drawings showed where every prop, every piece of furniture, every object in the scene was situated. The special effects experts, the cameramen and Schoedsack worked out formulas to determine the exact spot the camera would be placed, and the exact position each actor would take. They even figured on how high the lens had to be from the floor, how far the camera was from the player, how far the player from a table, for example, and whether the player had to be standing on a level floor or on a sloping one. All this was necessary to create the 'little people.'" Grant Williams stars as Scott Carey in the 1957 film "The Incredible Shrinking Man" – photograph copyright © 1957 by Universal Pictures. What Makes Teeny Look Tiny? Many of the tropes associated with subsequent miniaturisation movies are already evident in Dr. Cyclops: the use of high camera angles to increase the sense of diminished size; scaling up ordinary furniture to create mountains out of the mundane; the repurposing of sewing needles and scissors into weapons. Not to mention the ever-present threat of huge and terrifying predators, namely household spiders and domestic cats! All these dangers and more are faced by Scott Carey (Grant Williams) in the 1957 film The Incredible Shrinking Man, just as they are by the accidentally abbreviated youngsters inHoney, I Shrunk the Kids, made over thirty years later in 1989. Both of these movies boast beautifully executed special and visual effects, yet both battle constantly with one of the major challenges facing all makers of miniaturisation movies: how do you make a small world look really small? One of the keys is the effective use of depth of field. It's also one of the hardest things to get right. So what is depth of field? A stop-motion ant, animated by David Allen, gives a ride to the miniaturised youngsters in this ILM shot from "Honey, I Shrunk the Kids". Put simply, depth of field is the degree to which a camera lens can hold both the foreground and background of an image in focus at the same time. For example, if you point a camera at a landscape, pretty much everything you see is likely to be pin-sharp, from the wildflowers at your feet to the mountains on the distant horizon. Such an image therefore has a big depth of field. Use that same camera to photograph an ant, however, and the instant you get the insect in focus, everything behind and in front of it will immediately go blurry. In other words, the depth of field just turned shallow. Now, replace the ant with a tiny human being, and you'll see that in order to make a miniaturization movie look truly realistic, your cast should be surrounded not by a crisply rendered set, but a sea of blurs. The actors were pulled along on track-mounted mechanical saddles. 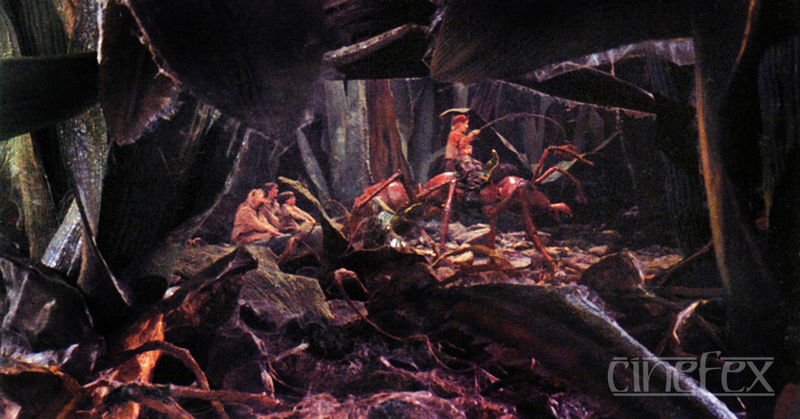 A split-screen was used to combine the live-action with the stop-animated ant. Unfortunately, re-creating shallow depth of field during a regular shoot on an ordinary soundstage is next to impossible – pick any shot from one of those early movies and you'll see that, for the most part, everything is in focus. Yet without that shallowness, the nagging sense remains that what you're seeing is nothing more than full-sized performers prancing through Brobdingnagian sets. Luckily for filmmakers, there's a "Get Out of Jail Free" card. The laws of physics decree that the smaller a camera, the greater its depth of field (another simplification, but the principle holds). In other words, if you were somehow able to discard that bulky RED Epic or IMAX camera and use a teeny-tiny camera instead (operated by an equally teeny-tiny crew, of course) you'd find your depth of field extending to the horizon once more. "Honey, we shrunk the camera, too!" In "Innerspace", Tuck Pendleton's miniaturised submersible pod approaches the optic nerve of his hapless host, Jack Putter. In this visual effects shot by ILM, the eyeball is a six-foot plexiglass dome and the pod is a motion-controlled bluescreen miniature. Miniaturisation movies aren't just about little people using the contents of a sewing box to fend off marauding arachnids. Release in 1966 and 1987 respectively, Fantastic Voyageand Innerspace see their protagonists first miniaturised, then injected into an environment far stranger – yet in reality no less mundane – than an everyday bedroom or backyard. Yes, we're talking about the interior of the human body. 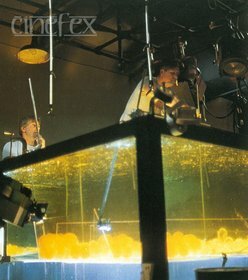 For a shot of simulated fat cells in "Innerspace", ILM technicians filled balloons with a concentrated Jello solution and photographed them upside-down in a water-filled tank. Whether it's showing Cora (Racquel Welch) fighting off hostile antibodies, or Lt. Tuck Pendleton (Dennis Quaid) struggling to navigate his micro-submersible through the raging rapids of a turbulent bloodstream, any film set in the squishy interior of a living human being is duty-bound to serve up some startling imagery. No surprise, then, that both of these films rely heavily on special and visual effects (indeed, both won Academy Awards for their intracorporeal visuals). 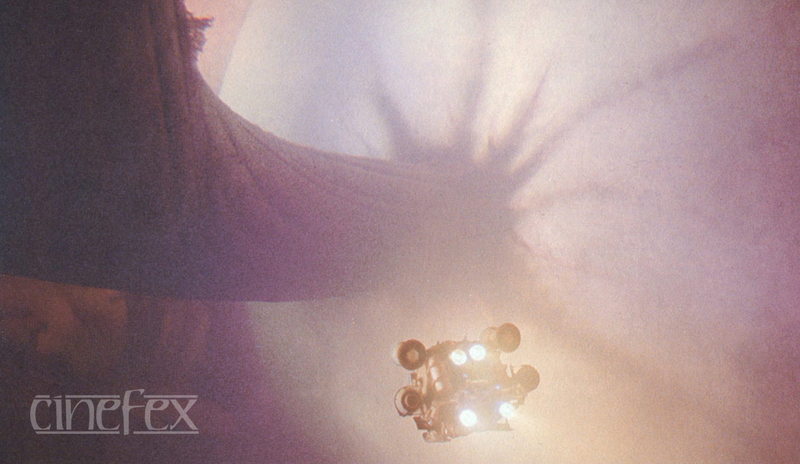 While Fantastic Voyage uses spectacular sets and gigantic props to conjure up its interior bodyscapes, Innerspace showcases the ingenuity of the visual effects team at Industrial Light & Magic. 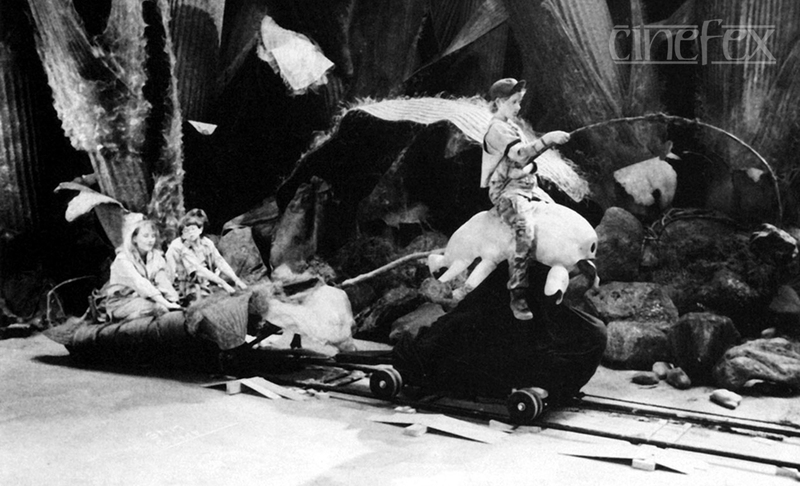 Relying heavily on practical models, VFX supervisor Dennis Muren had clear views on the way the miniature scenes would be shot. Interviewed in issue 32 of Cinefex, he described his championing of "a hand-held look, as though they were being photographed by tiny little cameramen with tiny little cameras." "We were always fighting the battle between the reality of the story – which is that the object is tiny – and the reality of our situation, which was that in order for it to be believable it had to be on a much larger scale. After looking at some footage of the pod, [Dennis Muren] said, 'It looks small.' And I said, 'It's supposed to look small.' Then Dennis said, 'Yeah, but it doesn't look like it was ever big.' So it became a matter of perspective. The 'microscopic' submersible pod had to look more majestic than, say, a tiny little blood cell bouncing around." In other words, it isn't just about showing an audience a miniature world. It's about making them believe it. Jed and Octavius (Owen Wilson and Steve Coogan) create a miniature apparatus capable of working a computer keyboard in "Night at the Museum: Secret of the Tomb"
As long as little people continue to fascinate filmmakers, visual effects artists will continue to develop new ways to put them on the screen. Among the most popular characters in the Night at the Museum movies are the unlikely double act of compact cowboy and Lilliputian legionnaire, Jed and Octavius. Instead of falling back on the "teeny-tiny film crew" conceit, the Night at the Museum films present their undersized characters as having been photographed with conventional cameras, thus raising the perennial problem of how to replicate the shallow depth of field characteristic of macro-photography. "When shooting macro-photography with traditional cameras, you typically have a very narrow depth of field. When compositing actors, this can typically result in a visual mismatch. For Night at the Museum: Secret of the Tomb, we created our background plates by shooting footage in which we racked focus from a locked-off camera. We then compiled all the in-focus areas into one image. This allowed us to do something that's traditionally not possible in miniature photography: create an infinite depth of field, and then adjust it to taste." Corey Stoll plays the nefarious Yellowjacket in Marvel's "Ant-Man". 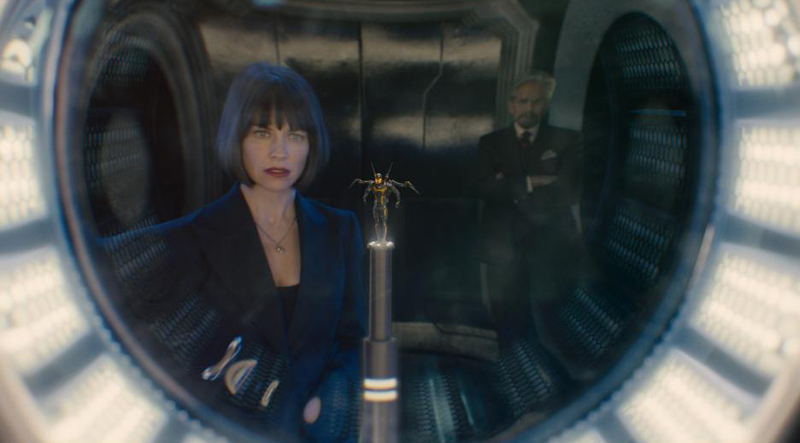 For Marvel's Ant-Man, the latest big movie to explore a miniature world, an enormous amount of research was undertaken in order to develop the right methodology for putting the film's bug-sized hero on screen. Central to this were decisions on how to achieve a balance between obeying the laws of camera physics and exercising artistic licence. "We experimented with a lot of different cameras, and a lot of different optics. From the beginning, we were trying to see how practically we could get small cameras into awkward places and shoot. We did a lot of research into macro-photography, and then ended up realising that what we needed to do was decide what was the right amount of depth of field to complement the action, on a shot-by-shot basis. "While there are formulae to define the characteristics of macro-photography – and we adopted that physical process for a lot of the movie – there were definitely moments where if we took a 35mm camera down to Ant-Man's level, the background would be so out of focus that you actually couldn't see anything in there at all, and the audience wouldn't know what they were looking at. We'd end up in a world where we were constantly throwing focus from foreground to background, and in our early tests that was actually quite jarring. 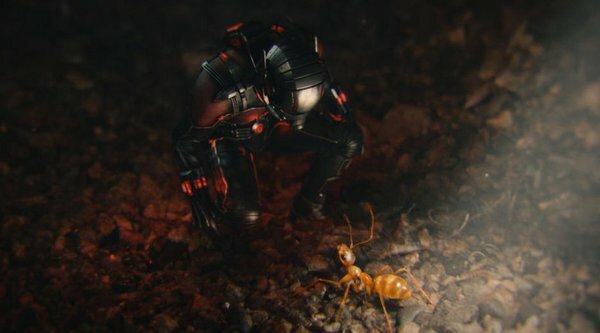 We decided, because we spent so much time in the macro-world with everything behind Ant-Man out of focus, we wanted to make our out-of-focus backgrounds look beautiful." Don't forget – the full story behind the visual effects of Ant-Man will be published in the fall edition of Cinefex magazine, available to preorder now. Stories about miniaturisation have been around for a long, long time. In 1726, Jonathan Swift chronicled the extraordinary voyages of Lemuel Gulliver, which sees his satirical novel's titular hero first meeting the diminutive denizens of the land of Lilliput, then enduring his own comparative reduction when he enters the giants' realm of Brobdingnag. Gulliver's Travels contains a good deal of philosophising on the importance of size, exploring the many metaphors inherent in the theme of miniaturisation. Years later, in his 1905 work Three Thousand Years among the Microbes, Mark Twain planted his miniaturised protagonist Huck inside the body of a tramp specifically to have him spout forth on the human condition. "I looked up, as if somehow I would grasp the heavens: the universe, worlds beyond number, God's silver tapestry spread across the night. And in that moment, I knew the answer to the riddle of the infinite … that existence begins and ends in man's conception, not nature's. And I felt my body dwindling, melting, becoming nothing. My fears melted away, and in their place came acceptance. All this vast majesty of creation, it had to mean something. And then I meant something, too. Yes, smaller than the smallest, I meant something, too. To God, there is no zero. I still exist!" But fear not – miniaturisation doesn't have to be heavy-going. Take the shrunken heroes of Edwin Pallander's 1902 novel The Adventures of a Micro-Man – they spend most of their time stranded in a domestic garden dodging bugs. Small worlds make for some pretty big adventures. 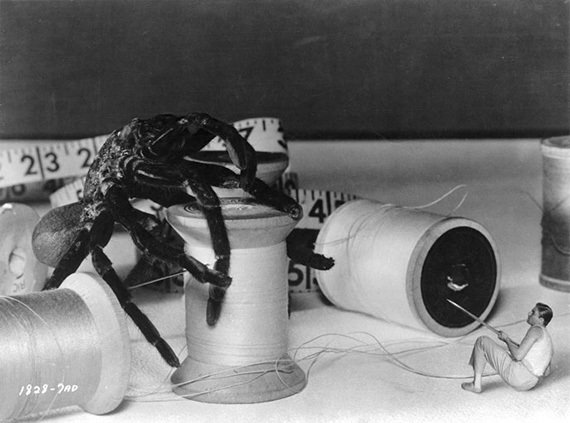 "The Incredible Shrinking Man" photograph copyright © 1957 by Universal Pictures. "Honey, I Shrunk the Kids" photographs © 1989 by Buena Vista Pictures Distribution, Inc. "Innerspace" photographs copyright © 1987 by Warner Bros, Inc. "Ant-Man" photographs copyright © 2015 by Marvel Entertainment.